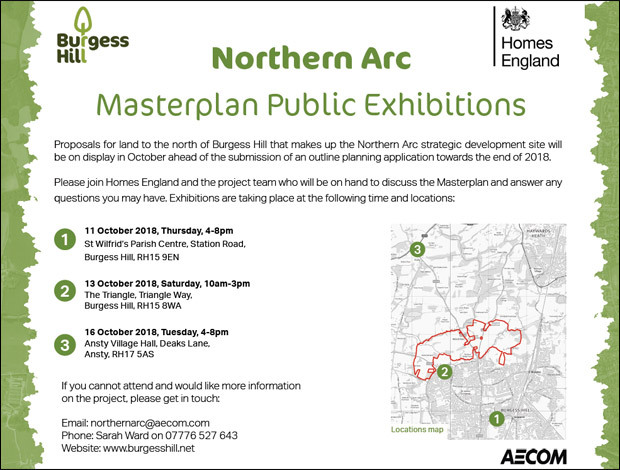 Homes England, the Government’s national housing agency, will be displaying plans for land to the north of Burgess Hill, known as the Northern Arc, this October ahead of the submission of an outline planning application towards the end of 2018. The 481 acre Northern Arc site was included in the newly adopted Mid Sussex District Council Local Plan and Homes England has been working with Mid Sussex District Council and West Sussex County Council since acquiring the site earlier this year. The Northern Arc will deliver approximately 3,500 new homes (including 30% affordable), new community facilities, three new schools, health provision, employment opportunities as well as vehicle, pedestrian and cycle connections.